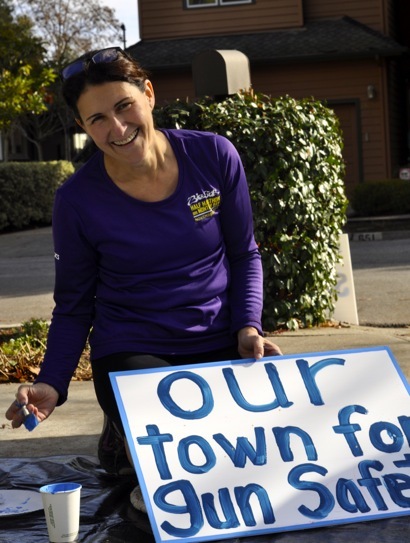 A group of about 25 area residents gathered in Menlo Park earlier today to paint signs in support for an end to gun violence. Among the participants were Becky Flanagan (top) and Irene Searles (right). In three hours of work, about 50 signs got painted. Along with the sign makers/protesters, how about a demand for improving mental illness treatments…..how about protesting the killing of millions of babies by PP, funded by taxpayer money? I know it feels like you’re accomplishing something putting up these signs, but if you’ll think objectively for a second, you’ll see that none of these laws you want to propose will achieve anything. It’s like asking for better tobacco control laws – just a misdirection of energy and resources. I don’t have the answer either on how to stop killings with or without whatever weapons, but that’s the problem to focus on, not ‘gun violence’. Is knife violence OK?